Red strawberries cause allergies, but white ones do not… This is the most concrete discovery about strawberry allergies to date which is credited to a group of biochemists at Lund University in Sweden. While examining the proteins in different varieties of strawberries, the group found out that a white strawberry variety called, Sofar, had relatively no traces of the suspected protein allergen. Right now, Swedish breeders are working on making the white strawberry just as flavorful as the red ones. So if you have an allergy to strawberries, pick the white ones instead, because the allergen found in these sweet plump juicy fruits is surprisingly related to its red color, although the group is still investigating why this is so. What their research does tell is that the strawberry allergen is similar to the allergen in birch pollen. If you have birch pollen allergies, it is common for you to develop secondary food allergies to strawberries or other foods, but if you have a strawberry allergy, it would not mean that you will develop an allergy to birch pollen though. How do you manage an allergy to strawberries? The safest way to manage a strawberry allergy is not to eat strawberries at all. Stay away from strawberry jam, dried strawberries, strawberry candies, and anything with strawberries in it. Although the white strawberry variety is known to contain less of the allergen, it is still better to be safe. Substitute your strawberry craving with other fruits that you are not allergic to. Wear a Medic Alert bracelet to alert others that you are allergic to strawberries. Carry medications with you as well in case of an allergic attack. 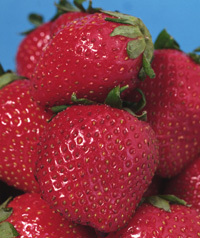 The symptoms of a strawberry allergy are similar to food allergy reactions. The most common symptom is oral allergy syndrome, characterized by allergic reactions in the mouth and throat. There can be tingling, itching, and swelling in the mouth, lips, tongue, throat, and palate. Watery itchy eyes, a runny nose, and sneezing can accompany the reactions. Those with hay fever are most susceptible, especially spring hay fever due to birch pollen, and summer hay fever due to ragweed pollen. Strawberries can also trigger skin allergies such as pruritis (itching), urticaria (hives), and contact dermatitis. The symptoms can also manifest as respiratory conditions like allergic rhinitis and asthma. More severe symptoms include vomiting, cramps, diarrhea, and on rare occasions, life threatening anaphylactic reactions such as swelling of the throat, wheezing, and trouble breathing.